The "wise" Insiders who have been guiding the CFR toward global control include familiar names such as David Rockefeller, Zbigniew Brzezinski, Henry Kissinger, George Shultz, Bill Clinton, Brent Scowcroft.... These men have led and instructed our presidents' cabinets again and again. They and countless others work silently behind the scenes to accomplish their goal of a socialist/communitarian world government. They may call themselves Republican or Democrats; it doesn't really matter. They control the financial resources needed to manipulate the economy and accomplish their goals. Their tyrannical form of "capitalism" destroys the personal incentive, moral guidelines and free enterprise that made America great. "The Society ['of the Elect'] should inspire and even own portions of the press for the press rules the mind of the people. The Society should always be searching for members who might by their position in the world by their energies or character forward the object…"
To fulfill his global vision, Rhodes established the Rhodes Trust. The inner circle of this "secret society" - "The Society of the Elect" -- included freemason Lord Alfred Milner, William T. Stead and Reginald Baliol Brett (titled Lord Esher). When Rhodes died in 1902, he left the "Society," the Rhodes Trust and the leadership primarily in the "hands" of Lord Milner. This Round Table Group would eventually establish numerous international branches. In the U.S.A, it would be called the Council on Foreign Relations (CFR). 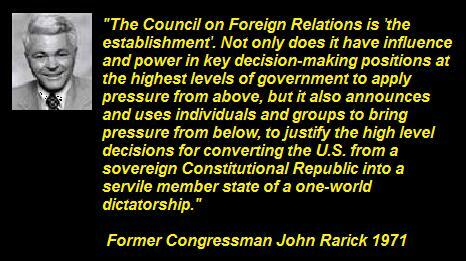 "there is a GROUP WITHIN the Council on Foreign Relations which belongs to a secret society, sworn to secrecy, and which more or less controls the CFR. CFR meetings are used for their own purposes, i.e., to push out ideas, to weigh up people who might be useful, to use meetings as a form for discussion." In other words, the layered organizational structure might be compared not only to Jesuits, as Cecil Rhodes indicated, but also to the Freemasons with its inner core of secret masters. "...the real menace of our republic is this invisible government which like a giant octopus sprawls its slimy length over city, State and nation. Like the octopus of real life, it operates under cover of self-created screen. It seizes in its long and powerful tentacles our executive officers, our legislative bodies, our schools, our courts, our newspapers and every agency created for the public protection." "The apex of the system was to be the Bank for International Settlements in Basel, Switzerland, a private bank owned and controlled by the world's central banks [including the US Federal Reserve] which were themselves private corporations. 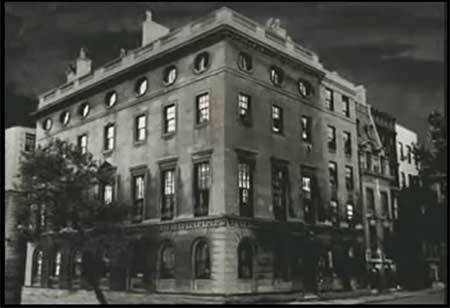 Each central bank... sought to dominate its government by its ability to control Treasury loans, to manipulate foreign exchanges, to influence the level of economic activity in the country, and to influence cooperative politicians by subsequent economic rewards...."
There you have a glimpse into the hidden Anglo-American power structure and its European branches. To see how all the pieces fit together, we suggest you read Brotherhood of Darkness] by Dr. Stan Monteith. The Fabians, the Round Table, and the Rhodes Scholars: "The secret goal of the Fabian Society was to create a godless, classless, socialistic society that was dedicated to the ultimate victory of Socialism which really meant Communism. "The aims of the Fabian Society were developed by [Sidney] Webb from what Englishman John Ruskin (1819-1900) taught at Oxford University....The Fabians were working towards a new world by indoctrinating young scholars who would eventually rise to power in various policy-making positions throughout the world by infiltrating educational institutions, government agencies, and political parties. "In 1905, American Fabians established the Rand School of [Social Science] in New York City. On September 12, 1905, five of the Fabians met at Peck's Restaurant in New York's Lower Manhattan: Upton Sinclair (well-known author and socialist), Jack London (well-known fiction writer), Rev. Thomas Wentworth Higginson (a Unitarian minister), J.G. Phelps Stokes, and Clarence Darrow (legendary lawyer). They incorporated the Intercollegiate Socialist Society for the purpose of promoting 'an intelligent interest in socialism among college men and women,' and established chapters at Harvard, Princeton, Columbia, New York University, and the University of Pennsylvania. Their true purpose was to begin de-Christianizing America. One of its founding members was John Dewey, the father of progressive education, whose philosophy consisted of 'atheism, socialism and evolution.'" CFR president Richard N. Haass [notice his behind-the-scenes influence in our government]: "Richard Haass is president of the Council on Foreign Relations, a position he has held since July 2003. "Haass also has been vice president and director of foreign policy studies at the Brookings Institution... a senior associate at the Carnegie Endowment for International Peace, a lecturer in Public Policy at Harvard University’s Kennedy School of Government, and a research associate at the International Institute for Strategic Studies. A Rhodes Scholar, Haass holds... both a Master and Doctor of Philosophy degrees from Oxford University." "...like its European prototype the FTAA has been carefully constructed as a framework not just as an economic union but also as a political union such as the European Union is in the final stage of becoming. "Shall we weave then our political structure into harmony with the likes of Mexico, Brazil and Venezuela? These are socialist governments at best. In the end the FTAA is not about trade as much as it is about political disintegration of an old order... a non-elected, supra-national political entity that in its first phase calls for our US Congress to turn over its authority (and our nation’s sovereignty) in matters of trade, labor and environmental law." "[According to] Carroll Quigley: 'The Power of financial capitalism had another far reaching plan, nothing less than to create a world system of financial control in private hands able to dominate the political system of each country and the economy of the world as a whole. This system was to be controlled in a feudalistic fashion by the central banks of the world acting in concert, by secret agreements arrived at in frequent meetings and conferences. The apex of the system was to be the Bank for International Settlements in Basle, Switzerland, a private bank owned and controlled by the world's central banks, which were themselves private corporations. Each central bank... sought to dominate its government by its ability to control treasury loans, to manipulate foreign exchanges, to influence the level of economic activity in the country, and to influence co-operative politicians by subsequent rewards in the business world." "...officially above the commission sits a Council of Ministers.... But the council is just more of the same elaborate illusion of accountable government. ... The European Parliament sits below this vast superstructure... designed to create an illusion of accountable democracy. A condescending pat on the head for voters held in contempt. "...the EU’s parliament has a built-in majority in favour of the social market. It is the repository of an unspoken agreement between the left and the multinationals. ... In effect, the left has said to the multinationals: you can have your markets stitched up for you, if we can indulge ourselves in endless social engineering. Big business has agreed. The result is a largely supportive parliament both from the left and right of the political divide." The "Americas" is moving in the same direction!" See The Revolutionary Roots of the UN. 3.Dennis L. Cuddy, Ph.D., Secret Records Revealed (Oklahoma City: Heartstone Publishing, 1994), pages 30, 32. 4. Dennis L. Cuddy, Ph.D., Chronology of Education with Quotable Quotes (Pro Family Forum, Highland City, FL 33846, 1994); pages 24.